For those living in the south (Parañaque, Muntinlupa, Las Piñas) who want to send their beloved gf, wife or mother Valentine flowers, take advantage of my sister-in-law's low, low prices. You can't pay her through credit card and they wouldn't have a barcode scanner when they do deliver the flowers, but you can easily pay them cash because the flowers are really affordable... with no quality sacrificed. 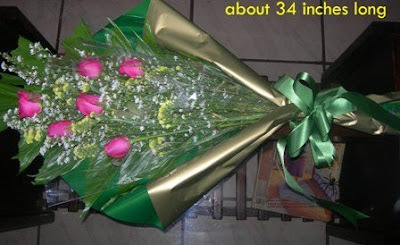 6 long stem pink roses for P660 -->P110/ pc. Other colors: Red or White Roses P90/pc. Arranged very well. VERY VERY AFFORDABLE.